Game two, 1997 World Series. Veteran sports photographer Modra makes final preparations from his perch overlooking the outfield in Miami’s Pro Player Stadium. A paramedic stands beside him, hand over heart, excited to be attending his first World Series. Modra says he’s been to every Series since 1980. “Man!’’ the awed paramedic replies. Many a sports fan would kill for Modra’s job. For over a quarter-century he has traveled the world on assignment for a variety of publications including, for the past 18 years, Sports Illustrated. 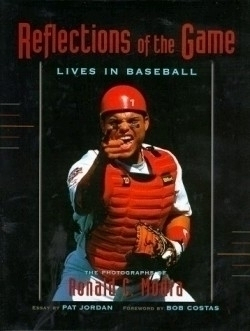 Reflections of the Game blends a collection of Modra’s finest baseball images with essays, short reflections and poetry about—and in some cases by—some of the sport’s biggest names. There’s Ozzie Smith’s trademark backflip. The unforgettable Pete Rose head-first slide. Reggie Jackson, Willie Stargell and Hank Aaron completing home-run swings. Pitchers Steve Carlton, Tug McGraw and Nolan Ryan catapulting themselves toward the plate, physical strain and fierce competitiveness etched on their contorted faces. Yet in the best journalistic tradition, Modra portrays not only the glory of baseball, but its pathos. He captures a graying Mickey Mantle, sitting alone in the grandstand hours before a spring training game. “God, I wish I could still play,” Mantle muses. Then there’s the arrogance that has alienated so many fans—Barry Bonds whining about unfair media treatment as he repeatedly breaks appointments for photo sessions; multimillionaire Gred Maddux demanding payment to pose for a Sports Illustrated cover shot. The word “love” surfaces more than once in this picture book. The true baseball fan will understand why. It may have lost the innocence of bygone days, but as these photos and writings make clear, it remains the great American pastime.